A slice of meatloaf or a platter of meatballs? We are torn when it comes to deciding between the two, but when it really comes down to it, finger food is the best option for all ages, especially for parties, game days and lunches. It’s part primal instinct, part convenience, and all about the flavor, of course. Have you ever dipped meatloaf into a creamy, homemade ranch dressing? It is a more likely situation to dip the perfectly formed, and baked, meatball into that deliciousness – just make sure that meatball is about 1 inch in diameter. You might already know how easy meatballs are to make too, particularly if you are a connoisseur of them, whether they be beef, pork or turkey. What you need to know about cooking with ground chicken is that it is not enough to mix some lean chicken meat with spices and call it a meal. That just won’t do! It is an absolute must to add moisture and a hint of fat (or use less lean meat), so that your creation does not dry out. And forget the breadcrumbs, those are so passé, coconut flour works wonderfully to hold everything together. 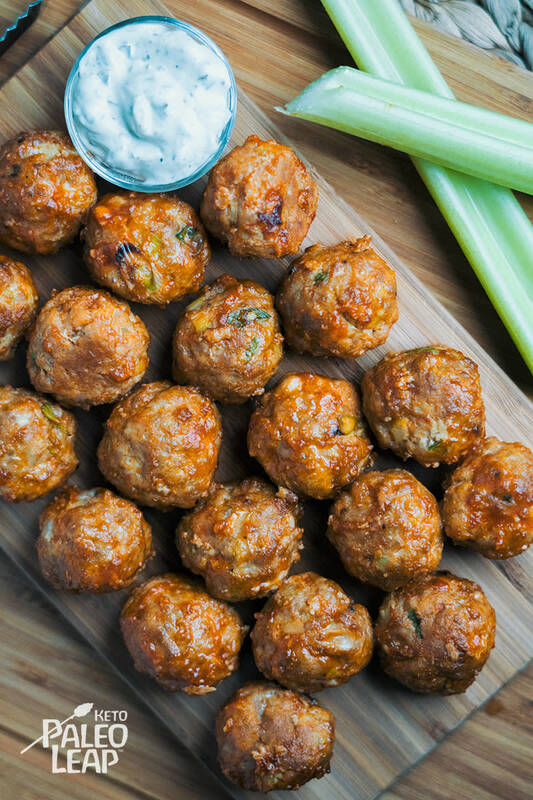 It may be a bit of an overkill, but while we are salivating over the idea of our meatballs drowning in a spicy buffalo sauce, chicken with a buffalo ranch coleslaw comes immediately to mind – maybe we’ll save that for later in the week. Right now, however, this meal is in need of a cooling cucumber salad. In a bowl combine all ingredients, except the hot sauce, and season to taste. Mix everything until well combined, add more coconut flour if the mixture is too runny. Form small balls of about 1 inch in diameter and place on a parchment-lined baking sheet. Cook in the oven 30 to 35 minutes, or until cooked through and no longer pink. Gently toss the meatballs with the buffalo sauce, and heat another 4 to 5 minutes in the oven. Serve with fresh celery sticks and homemade ranch sauce.